I remember the moment I first heard The Sherlocks like it was yesterday. I was in a dodgy B&B in Ireland listening to some generic background music on YouTube getting ready for an evening out with the family and a song came on that caught me the second the first riff kicked in. Live for the Moment, which would go on to be the name of their debut record years later, was a track that reminded me of every single one of my music heroes, bundled into one huge track. I instantly clicked repeat as it ended and since then, I’ve been hooked to every release from their First Bite of the Apple EP all the way to their latest track Magic Man. Watching them grow from a band playing to 5 people in Newcastle, to their Dublin debut, right across the country headlining huge shows in the last 24 months has been a pleasure and I finally had the opportunity to interview the lads at this year’s Bingley Music Live. Speaking about the festival season they’ve just had, Kiaran recalled some of the highlights. “We played Neighbourhood Weekender in Warrington, Y Not was a big one, tonight were pretty good and Tramlines felt like a homecoming. Its been one of the best, I’d say the best festival season we’ve had.” Travelling further afield, Brandon Crook reflected on their time in Japan citing Summer Sonic as his most memorable one of the summer. 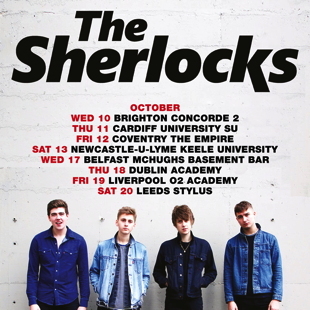 Even with the success it’s evident The Sherlocks have huge ambition to keep on this upwards trajectory. “When we’ve been out in the arenas, it has definitely made us want to do it for ourselves rather than just supporting. When you get that taste of arenas, it’s like your first beer you’re like woah, wouldn’t mind a few more of them” Brandon said. “Yeah it’s like when you sneak in the pub with your dad, you just wanna get in every week it’s so good” Kiaran adds. When asked about what would be top of their music bucket lists, the ambition continued to seep through. Bran says that headlining hometown stadium Hillsborough would be the dream with Andy suggesting Sheffield Arena would be a big one too, Kiaran suggested longevity and dying on stage would be up there with the perfect career whilst Josh simply wanted to have fun on every continent on earth. With new music on the way imminently, it’s clear the guys believe their upcoming stuff is bigger than ever before. “Oh, it’s bigger. We were in the practice room 2 days ago and we just want to get recording, but we’re chucking new stuff in there all the time” Kiaran said. “We played Magic Man for the first time and I started crying, it was that good and big I just couldn’t play anymore” Josh admitted.” Stylistically, the lads suggested that the sound was “Sherlocks, with a reggae twist” and a tonne of slap bass! We cannot wait for the new music and to see what 2019 holds for The Sherlocks. You can catch them this October though across the UK finishing off the Live for the Moment era (dates below).